Local residents and visitors are invited to the American Cancer Society’s Real Men Wear Pink Making Strides Against Breast Cancer Happy Hour for Hope, which will be held at Taberna Tapas & Wine Bar at the Brick Walk Promenade in Fairfield, Connecticut, on Tuesday evening, October 25, 2016, from 5:30 p.m. – 7:30 p.m. Tracy Jo and the Toad will perform acoustic music at this breast cancer benefit. Attendees are asked to please wear something pink, to this festive party — there will be prizes for the “pinkest” man, woman, and couple. There will also be a drawing, for gift certificates from local businsses, including several gift certificates for dinner at Taberna. Additionally, there will be a hot pink Maserati, from Maserati of Wesport, that will be parked in front of Taberna during this Happy Hour. This distinctive automobile is used to support the national campaign to raise breast cancer awareness. 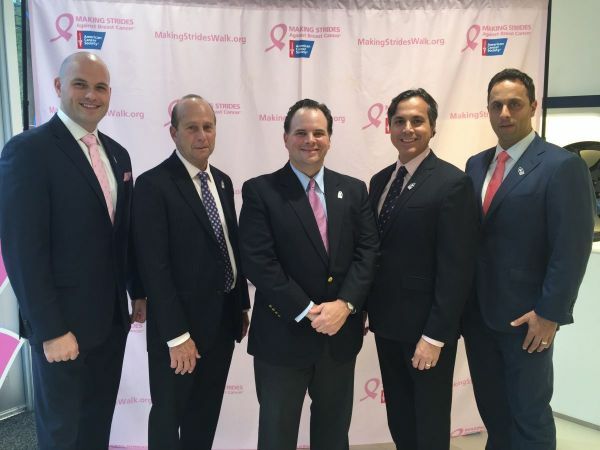 Guest bartenders, at this event, will be Real Men Wear Pink Fairfield candidates Josph Barbetta, Michael Burdo, Esq., Steven D’Amico, and Robert Kalina. Special guests include Fairfield First Selectman Michael Tetreau, Selectman Christopher Tymniak, Police Chief Gary MacNamara and Probate Judge Daniel F. Caruso.